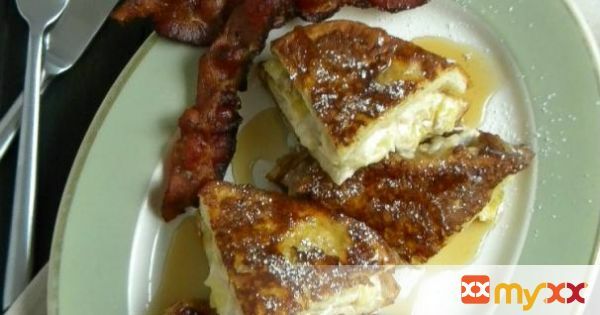 A delicious french toast recipe stuffed with bananas and honey and spiced cream cheese. 1. In a small bowl combine the softened cream cheese, honey, cinnamon, nutmeg and lemon juice, set aside while preparing the batter. 3. Pour the batter into a wide, shallow dish (like a pie plate). 4. Spread the filling mixture equally over 1 side of each slice of bread, divide the sliced bananas between 4 slices of the bread, top with the remaining 4 slices, press lightly. 5. Melt 2 t. butter and 2 t. oil in a 12 inch nonstick skillet over medium heat until the butter foams and then subsides. 6. Working with one sandwich at a time dip both sides in the batter and let the excess drip away, add to the hot pan, repeat with a second sandwich. 7. Cook until golden brown on the first side, around 3-5 minutes, flip and repeat on the second side. 8. Repeat this process with the remaining, oil, butter and sandwiches. 9. To serve, cut into triangles and serve with maple syrup.